Where Can I See the Guitars? Can I Play the Guitars? What Guitars Will I See? Playing the classical guitar has been a passion for me for over 30 years and having always played on very modest guitars it was not until I received my Romanillos guitar (for which I waited for so long that I'd forgotten about it) that I realised what I had been missing. 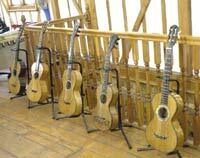 I had heard of Torres, Hauser, Fleta, Romanillos et al but never had the opportunity to play these instruments. I was also aware of how ignorant I was about the construction of the guitar and how different they could sound. 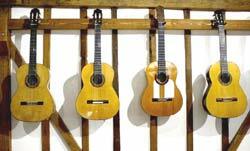 It was after getting my beautiful Romanillos and my subsequent friendship with Liam Romanillos that I became interested in the construction and history of the guitar and the gallery is dedicated to the art of the luthier. Over the years I have collected many beautiful instruments but have always been aware that they were built to be played and not hidden from view as is the case in some other collections. My main interest is in the modern classical guitar (ie post Antonio Torres) although there are a few older instruments which serve to demonstrate the development of the guitar. So, in order to give something back to the instrument I love, I have decided to make my collection accessible to players to play and luthiers to inspect. When Can I See the Guitars? For security and insurance reasons the exhibition is not a permanent one and the guitars are brought to The Granary for specific dates which will be published on this website. Yes, as long as you are not a total beginner. Please wear a long-sleeved jumper/sweatshirt and no belt buckles! The Granary is in <?xml:namespace prefix = st1 ns = "urn:schemas-microsoft-com:office:smarttags"> Hertfordshire, United Kingdom. Full directions etc. and details will be sent to you by e-mail. The exhibition is not a permanent one and is available only on specific dates. As the logistics of transporting over 40 guitars safely is complex, I can only consider opening if there are at least 10+ in you group and of course the date is convenient. There is no entrance fee but a donation equivalent to the cost of a packet of strings would be appreciated. What Guitars Will I See & Play? The list below is not complete but will give you an idea of what to expect. You can see pictures of the guitars on the names below which are links. This site is still under construction - more pictures will be added in the future. Any restoration work needed on the guitars is carried out by luthier, David Merrin. Visits are by personal invite only. If you would like to come along, you will need to email me with your name and address and telephone number. I will email you back with directions etc.